A group of major European nations recognized Venezuelan opposition leader Juan Guaido as the country’s interim president on Monday, urging him to hold free and fair elections. The coordinated move came after President Nicolas Maduro ignored a demand set by some EU nations to call snap elections by the end of Sunday. Spain, the United Kingdom, France and Germany were among the European nations to recognize Guaido’s legitimacy. 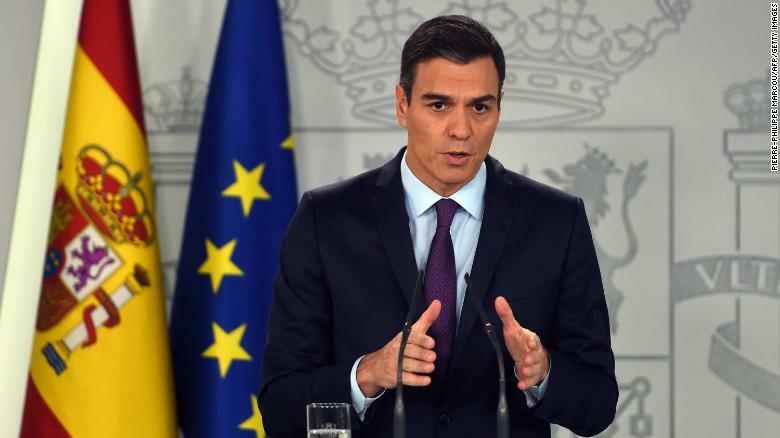 Spain’s Prime Minister Pedro Sanchez speaks about Venezuela at the Moncloa Palace on Monday. Austria, Denmark, the Netherlands, Poland, the Czech Republic, Belgium, Estonia and Sweden also said they would recognize Guaido as Venezuela’s interim president. Speaking to reporters outside the National Assembly in Caracas on Monday, Guaido said the recognition he has received from some EU countries was meaningful for all Venezuelans. “This recognition from more than 20 countries is a recognition for all you Venezuelans who never stopped fighting and we will never stop doing it until we achieve our democracy and freedom in Venezuela,” said Guaido. 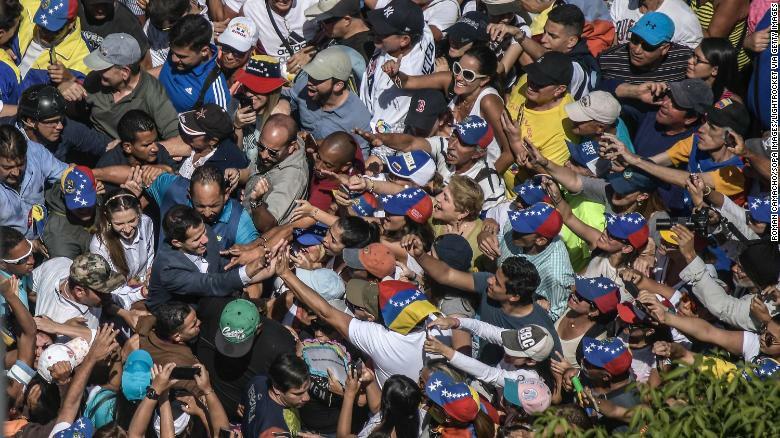 A crowd surrounds Juan Guaido during a protest against Maduro on Saturday. Maduro rejected the “ultimatum” set by EU leaders, asserting that previous elections that ushered him into another six-year term were fair. “We don’t accept ultimatums from anyone,” Maduro said in an interview with Spanish TV network LaSexta on Sunday. It was not clear why the EU as a whole did not recognize Guaido. Speaking in Brussels on Monday, EU foreign policy chief Federica Mogherini said that while the EU never recognized Venezuela’s elections last year as legitimate, the decision to recognize a head of state was up to individual EU members alone. EU leaders have hailed a newly formed “international contact group,” which will meet in Montevideo, Uruguay, on Thursday to discuss a “political and peaceful process” to ending the Venezuela crisis. French President Emmanuel Macron said on Monday that France supported the group of EU and Latin American countries and their role in Venezuela’s transition period, after recognizing Guaido as “acting President” in a tweet. 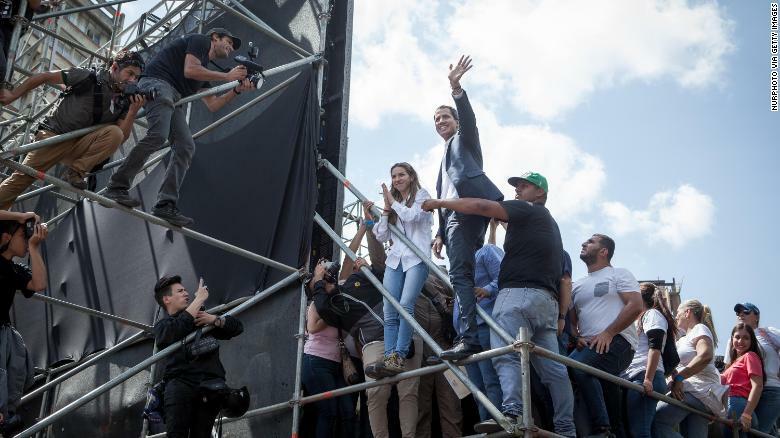 Juan Guaido waves to thousands of his at a rally in the capital Caracas on Saturday. Speaking on France Inter radio on Monday, French Foreign Minister Jean-Yves Le Drian said the decision to recognize Guaido was “not foreign meddling,” as Russia, one of Maduro’s key allies, has suggested. Russia and China, which have together invested billions of dollars into Venezuela, have continued to back Maduro. China said on Monday that, no matter the outcome of the current political crisis, cooperation with Venezuela would not be damaged. Since declaring himself acting president on January 23 — invoking a constitutional rule to open a rare challenge to Maduro’s presidency — Guaido’s leadership had already been recognized by Canada, the United States, Australia, and a number of Latin American countries. On Monday, Canada hosted a meeting of the Lima Group regional bloc to discuss how the international community can further aid the people of Venezuela, including through immediate humanitarian assistance. The group also issued a statement welcoming Venezuela’s interim government as a full member, and called on the country’s armed forces to show loyalty to Guaido, according to Canadian Minister of Foreign Affairs Chrystia Freeland. 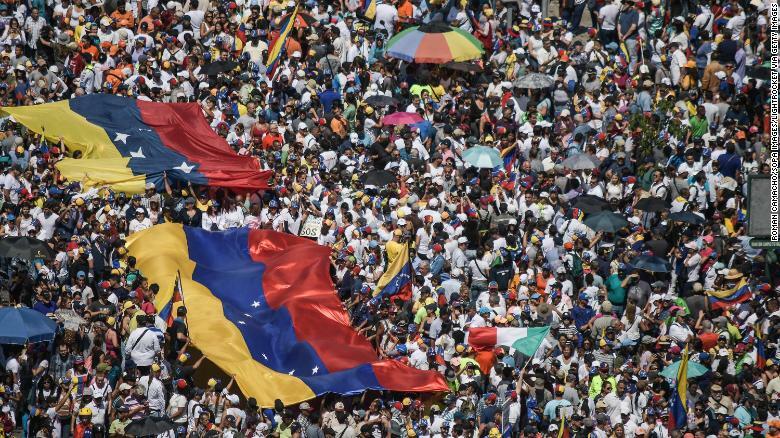 Guaido supporters hold huge Venezuelan flags during a protest against Maduro on Saturday. USAID has already begun packaging pallets of foodstuffs following national security adviser John Bolton’s announcement last week that it would send humanitarian aid. Guaido has said that humanitarian aid will begin to flow into Venezuela in the coming days, defying Maduro’s repeated refusal of assistance in the face of food and medicine shortages. He outlined the move as part of a plan to push the military into cooperating with the opposition. In addition to focusing on aid, Guaido also said his team would focus on demanding a freeze on Venezuelan assets in the EU. Maduro has repeatedly denied that Venezuela is in a crisis, suggesting aid efforts were part of an international plan to destabilize his socialist regime. During Maduro’s tenure as president, the once-wealthy oil nation has descended into economic collapse and a humanitarian crisis. On Monday, Guaido paid his respects to the victims of the recent protests in Caracas, saying 69 people had been killed so far this year in the country for political reasons.